With a bunch of new devices from Samsung, HTC and Sony joining an already crowded smartphone market, this Spring is certainly a good time to be upgrading your handset. With so many reviews offering varied, mostly opinion-based coverage on which deserves your hard-earned cash, PhoneArena has tried to keep things objective by posting a display performance comparison of each of the industry’s most sought-after handsets. Included in the line-up is the iPhone 5, Samsung’s current and upcoming Galaxy S4 and the current Galaxy S III, Sony’s waterproof Xperia Z, the HTC One, and Nokia’s Lumia 920. Check out the comparison after the jump! The first test looked at the brightness and visibility of the displays of each device, but despite the continued endeavors of Samsung and its Super AMOLED technology the LCDs still reign supreme – at least in this particular category. 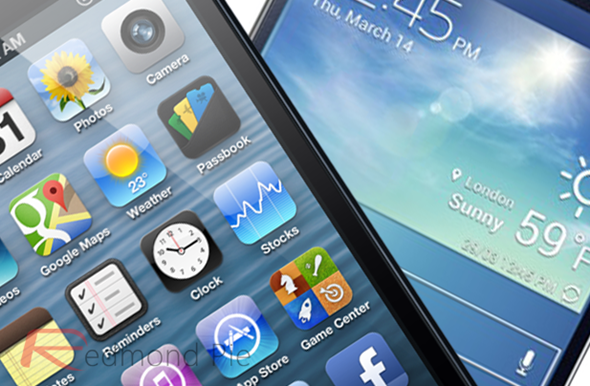 The brightness of the iPhone 5 came out on top, with the HTC One, Sony Xperia Z and Nokia Lumia 920 each appearing a smidge brighter than the Galaxy S III and S4. Having ascertained that the iPhone 5 was superior in terms of brightness, PhoneArena then looked at the viewing angles of each device. As it turned out, the Sony Xperia Z had the worst viewing angles of the whole lot, with the Galaxy S4 and S III once again failing to cover themselves in glory. The iPhone 5 and HTC One both impressed in this particular test, with each handset managing to "retain a more natural color balance." The next test was the resolution, and with the HTC One boasting the highest pixel density of the bunch, its on-paper rep was confirmed by PhoneArena‘s stress tests. At 468 ppi, it’s a cut above the rest, but the Xperia Z and Galaxy S4 – both of which include 5-inch displays of 441 ppi, ran a close second place. It’s worth pointing out, however, that the average eye would struggle to notice pixels on any of these smartphones, since even the S III, in last place with 306 ppi, is still relatively sharp. 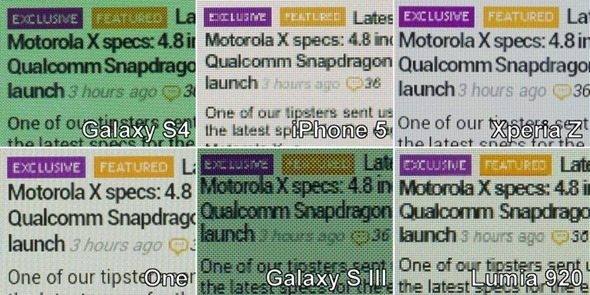 Finally, PhoneArena looked at the color reproduction of each device, and found the iPhone 5 just shaded it from the HTC One. "Their advanced LCD displays output super-realistic, yet vibrant and lively colors that manage to please both the purist users and those who just want a breath-taking image," noted the report. Overall, it would seem pretty conclusive that the HTC One and iPhone 5’s displays are superior to those of their peers. But geek benchmarks and comparisons don’t determine consumer expenditure, and with Samsung enjoying such a strong presence in the market with its Galaxy brand, it will take more than this to prevent the Korean company from outselling its rivals in the coming months. In your view, putting the whole comparison aside, which device has the best display in the market right now? Share your thoughts with us via the usual mediums below.